Join us for the third presentation of Chapman University’s s Italian Perspective series, this year focusing on the intersection between cinema and culture. It will take place at the Musco Center for the Arts on Saturday, April 7, 2018 from 10:00 am to 1:00 pm. 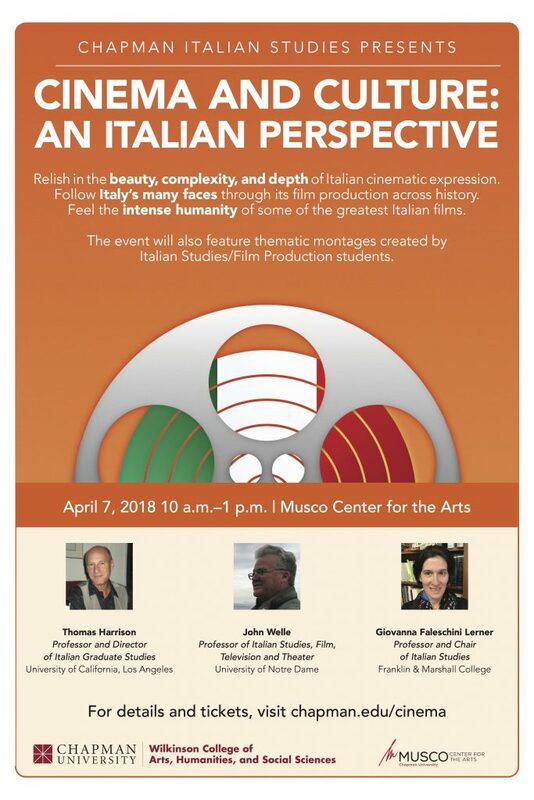 A celebration of Italian cinema and culture, exploring the beauty and complexity of Italy’s cultural and artistic import, Cinema and Culture: An Italian Perspective will be a unique opportunity to learn about the cultural significance and influence of Italian cinema throughout history. A group of distinguished scholars of Italian Studies will guide us through a fascinating journey beginning in silent cinema, continuing through the Italian post-war realist cinema, and the creative innovations of art cinema in the Sixties and Seventies. The symposium will feature thematic montages created by Italian Studies and Film Production students. *A portion of the proceeds will benefit student scholarships to Italy. A no-charge parking pass is included when you choose the print-at-home ticket option – it will be included in the e-ticket attachment emailed to you.